Brandon Sanderson has built a reputation as a best-selling author around his Cosmere universe. 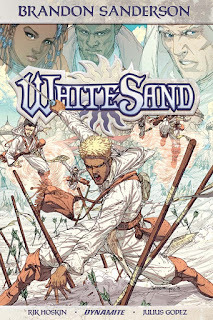 Not all of his work manages to make it into that universe and Dynamite is looking to remedy that by publishing a trilogy of graphic novels in White Sand. White Sand has been adapted by Rik Hoskin, with art by Julius Gopez and colors by Ross Campbell. With the creative team working so closely with Sanderson, White Sand promises to be a spectacular new saga for lovers of fantasy and adventure, as its powerful imagery and storyline are built on Sanderson's celebrated approach to magical systems. "Dynamite has been excellent to work with. Rik Hoskin, the person hired to do the adaptation, is a fantastic writer - and he really managed to preserve the core of my story, using my own dialogue and descriptions, while cutting out all the chaff," says author Brandon Sanderson. "The artist Julius Gopez, the colorist Ross Campbell, the letterer Marshall Dillon, and the editor Rich Young have all done a fabulously great job." Welcome to Taldain, a planet like no other. Taldain has no rotation; instead it is forever locked in place, one half in brilliant sunlight, the other in eternal night. The most powerful figures on Dayside are the Sand Masters, harnessing arcane powers to magically manipulate sand for construction, transportation, and spectacular displays of attack and defense. The weakest of their number is Kenton, whose paltry abilities pale in comparison to his peers and to his father, the powerful Lord Mastrell Praxton. However, a conspiracy is afoot on Dayside that threatens the stability of the whole planet. When the Sand Masters are ambushed and slaughtered, Kenton believes himself to be the sole survivor. With enemies closing in on all sides, Kenton finds himself in an unlikely partnership with a mysterious Darksider called Khriss -- who hides secrets of her own. "I've admired Brandon Sanderson's brilliant writing ever since I first read his work on the Wheel of Time series, after he assumed the reins from Robert Jordan," says Nick Barrucci, CEO/Publisher of Dynamite Entertainment. "Thanks to our chats with his agent Joshua Bilmes, we sealed a deal to work with Brandon directly, and White Sand is the first project born from that exciting venture! We're very excited to be working hand-in-hand with him, and can't wait for fans to read this mind-blowing original graphic novel." White Sand Vol. 1 is on sale at finer comic shops and bookstores everywhere this June and features 160 pages of spellbinding story and breathtaking art. Look for this deluxe hardcover format for $24.99. Full press release below. MARCH 17th, MOUNT LAUREL, NJ: Dynamite Entertainment is pleased to announce the publication of a new trilogy of graphic novels from New York Times best-selling author Brandon Sanderson! White Sand triumphantly brings to life Sanderson's unpublished novel, a crucial missing part of Sanderson's sprawling Cosmere universe. Welcome to Taldain, a planet like no other. Taldain has no rotation; instead it is forever locked in place, one half in brilliant sunlight, the other in eternal night. The most powerful figures on Dayside are the Sand Masters, harnessing arcane powers to magically manipulate sand for construction, transportation, and spectacular displays of attack and defense. The weakest of their number is Kenton, whose paltry abilities pale in comparison to his peers and to his father, the powerful Lord Mastrell Praxton. However, a conspiracy is afoot on Dayside that threatens the stability of the whole planet. When the Sand Masters are ambushed and slaughtered, Kenton believes himself to be the sole survivor. With enemies closing in on all sides, Kenton finds himself in an unlikely partnership with a mysterious Darksider called Khriss -- who hides secrets of her own. 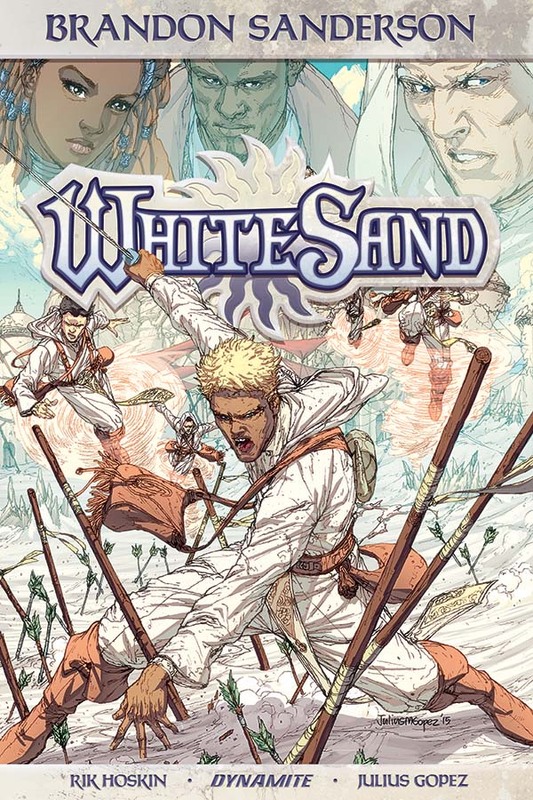 White Sand has been adapted by Rik Hoskin, scripter of Amazon's best-selling Mercy Thompson graphic novel, with art by Julius Gopez and colors by Ross Campbell. With the creative team working so closely with Sanderson, White Sand promises to be a spectacular new saga for lovers of fantasy and adventure, as its powerful imagery and storyline are built on Sanderson's celebrated approach to magical systems. White Sand Vol. 1 is on sale at finer comic shops and bookstores everywhere this June, and features 160 pages of spellbinding story and breathtaking art, from a true master of the genre! Look for this deluxe hardcover format for $24.99.